Intrigued by the sonorous "enchanted objects", coupled with my eye latching onto the phrase "Ambient information displays don't require any effort or cognitive load" in the snapshot from the book, I went and looked up what the book was. It's "Enchanted Objects" by David Rose, a book about the coming "internet of things", released this past July. In the talk, he highlights the four "very different" futures he discusses in the book. Future One: Terminal world - glass slabs and painted. There will be more screens and more gesture, but the interaction will be the same as we have today: a call and response to a device waiting on us that requires a lot of our attention. That's the problem with these - how much attention they demand. Market incentives keep this "terminal world" in place. Future Two - prosthetics: superhuman selves. It is transformational for amputees and those receiving cochlear implants, but problematic for wearable computers (like Glass - note that he is giving this talk at Google's Cambridge office), as it keeps users in their own "visual space" that will limit us socially. Future Three - Animism: social robots. The "outsourced model", the "Downton fantasy". "The more that these agents can look like us and reflect our emotional states and have their own emotional states - that will accelerate how much we bond with them." The Future He Foresees: Future Four - Enchanted objects. "Neither convergence, nor on us, nor personalitied." They will anticipate their use. His initial example is the "ambient umbrella," that can alert you that you'd need it later in the day by being able to check the weather. He also mentions the Anoto pen, which you can write with, but it also has a microphone and will watch as you write (on special paper) so that if you want to listen at a certain point in time, you can put the pen in the place where you writing at that point and it will start playing back. The point is, the "enchanted object" does not have to be a "bizarre other thing." He discusses several of these types of objects (some of which he invented), but one of the main themes is that they do not have a screen, instead communicating in other ways. Enhancing creativity is another focus: to create, make and play. I want the magic paintbrush! And how might you discover what enchanted objects to look for? 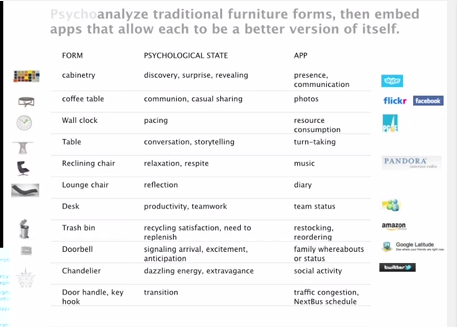 He did some mental experiments where he "psychoanalyzed traditional furniture forms," looking for app ideas that would "allow each to be a better version of itself." "Enchanted objects will make interfaces tangible, haptic, incidental, embedded, natural, expressive and humanistic." "If you look at the diversification and complexity of life on a coral reef, or of any mature toolset, like chisels, or shoes, or drinking glasses. As these categories mature, you have huge diversification, and specialization, and redundancy. And that's what I would hope we would have in terms our tools. That we don't have convergence into one thing. But we have this huge specialization and divergence."